Hi again for the 3rd time I am asking for the Halloween challlenge what do we have to do in PART 3 ?? Love the organ! Looks like it’ll go nicely with the haunted castle theme. I’m very happy that kinzcash isn’t an option for the super wheel because I always had the worst luck with it and ended up with the kinzcash. Hoping for the couch or the door with the chains. pretty surprised it is not on newz?? If anyone needs fall leaf prizes from this year I have tonnsss of the crates, mice, apple tree seeds, etc so let me know. I also have tons of last year’s prizes. RubyCubes I will respond to your mail I promise!! 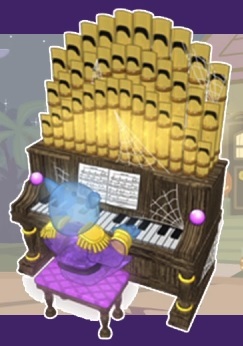 anyone want to make a comment about a haunted organ? April…. so sorry to hear the devastating news about Diesel…I know you must be facing a tough decision… Lean on your friends here for support..
Sending a hug your way ! Will keep you in my thoughts and prayers. ‘The Ghost and Mr. Chicken’ anyone? is that a don knotts film? Yes!! ❤️ I love that movie! gagagee THANK YOU SO MUCH for letting me know . Your awesome !! I hate to start daily activities and play something that is needed for challenge and not realize I needed NOT to do it .It is the 1 thing that bugs me I hate to waste a full day on these . Now that my puter is broke I can’t go forward only back I have to pay to finish if its a difficult game, stupid puter I have a few accounts and help a few others with their game so I have to plan things out. . You know kids, sisters grandkids we help each other . I usually get the harder games to play but we all get done. I do really appreciate the help very much . Sometimes simple kindnesses help us get through the day . THANK YOU !! I DO LOVE coming to visit you all your all so smart too. I haven’t posted in a long time, so much going on with medical problems. My hubby was taken to the ER twice in September and the cardio doctor put three stents in one value. He just had a colonoscopy today, he was bleeding a few weeks ago, they removed two polps and sent them for biopsy. Besides dialysis three days a weeks we have had doctor appts on the other days. It never ends. I have tried to read all the comments, but I am not having much luck. If you play Pokemon Go can you please friend me, I send gifts everyday. There is a little park near me and I enjoy driving through it and collecting stuff for Pokey. I would apple seeds, love those trees. April… thinking of you and wishing there was something I could do to help..
KinzGram… you have had so many of your own challenges…Life throws so many bumps in the road… Will keep you in my thoughts as well.. Hope all of your upcoming tests bring good results..
Stormy morning here but temp expected to be in the 70’s..Making a to do list and dreading weekly trip to grocery store.. Shopping for Sunday gathering and am planning on serving spaghetti ! Almost unanimous vote..
MomT.. glad you received the challenge info..
moms.. thanks for the sneak peek Halloween treat bag..I peeked !! Finished Halloween challenge this morning… Ghost plushy is really small but cute ! Wishing pleasant weekend for all!! KinzGram, we play Pokemon Go! I’ll friend you! I’m PumaPardus on there too. I send gifts… frequently/occasionally. Sometimes with Kiddo, I forget to play daily. finally got to level three on one acct today……….. Does anyone have any more Fall Fest Fences they’d be interested in trading, maybe for other fall fest items (I have lots of apple tree and mice plushies). I’m in need of 4-5 more to complete a pen around my peas. Puma – I have a few fences, not sure how many though, probably 3 or 4. I can send them later this afternoon. I thought the mice plushes were pretty cute, but I only was only able to get one. So if you wanna send me one of those for the fences, I’d appreciate it. kgh – i am SO sorry for all of the medical issues, that’s overwhelming!!!! i love he is adventurous! My brain is fried. Why did I take a biological psychology class? I hate science and have always struggled with it. I’m trying to wrap my head around the articles for my paper, but they’re so sciencey and full of words and concepts I’m unfamiliar with. Treated myself to two new ‘Kinz friends that I found at Ollie’s today for $2.99!! A Black Bear and a Schnauzer, Moritz and Kearney, respectively. They had a HUGE box full of Himalayan cats, Persians, White Poodles, and White&Pink Yorkies, but I’ve got all those already (multiples even LOL). Puma – Thank you! Too bad I can’t send you my textbook via kinzpost, there are some interesting parts in it, although it is a bit dated (it references the DSM IV, which is no longer used). Learning about the stuff is pretty interesting, but actually having to use that information for a paper is frustrating since most of the concepts i’m unfamiliar with. I can’t just read through the articles and have a decent understanding of them. I have to read some parts multiple times, google certain terms or phrases, etc. It’s frustrating. I haven’t had a biology class in 9 years, so I have no background information on the stuff, aside from the psychology aspects of it. What I need is for someone to explain these articles to me in plain english. No sciencey nonsense. For my psychological stats class the professor has questions on our assignments that ask us to conceptually explain the findings to people who don’t know anything about math/stats. That’s what I need for this! LOL my stats professor would get a kick out of that meme! Its done… I guess. I still have to get all the formatting and citations done, but that doesn’t require much brain power, so I’m good. I still have a quiz to do for my online class, but that can wait until tomorrow because my brain has decided that its done with today. April … thinking of how you are doing…. no words.. Tribe down 2-0 … not looking good for CLE.. but not ready to give up … Next game is here… hopefully crowd can rally the team.. Packing up for Sunday get together…. really a lot of work but always fun to have dinner and watch football ! I’m not very close to the 3rd step of challenge yet! Still working on step 2. KinzGram – Sorry about all that you dh is going through. Dee – Terrific score on Home Before Dark! I can’t remember how I am at that game. Love, love, love my lil’ orange goblin! So adorable! My youngest dd has been admiring it and asked me to show it to her friend (who gave up ww years ago, but I maintain her account). LOL! The girls may get on to play Supermodelz tonight for old time sake! Yay! So fun for me to have some comrades! Even if it is only for a short time this eve. Ha ha! Busy with class prep, but I’ll check in on Tuesday. Full day tomorrow! Oh….speaking of something irritating….two times I have had a pet request to do a job AFTER I have done one! So, so annoying! btw if you wanna friend me puma or anyone else, my code is 0754 5800 3761. Yay, I’ll add you Bepsy! Mine is 3917 2834 6906. I send gifts… sort of frequently. So I recently saw a post on another Webkinz blog about adding “TreePeanut” as a friend, and since they’ve apparently played forever, they’ll send you some awesome gifts. I tried it, and lo, TreePeanut sent me three incredible fall items- all from Fall eStore Promo Mystery bags from *2014*!! An Autumn Fireplace, Fall Fence, and a Fall Leaf Swing. My little Autumn Loving heart is so full today! The pre-fab Thank-You notes in Webkinz World cannot possibly explain to TreePeanut how much I love these items, and how tickled they have made my fall season. Thank you, TreePeanut, wherever, and whoever, you are. You couldn’t have hand-picked any more perfect items for me to add to my Webkinz Collection. <3 And now I get to build another fall-themed hygge-focused condo room that highlights the fireplace as a fixture! Happy autumn days to ME! good morning all and happy columbus day to the usa folks and happy thanksgiving to the canadians! Planning on going to see A Star is Born !! Bought the soundtrack on Friday and have been listening all weekend… GAGA sure has some beautiful sounding pipes !!!! !